Plastic, polymer and styrene production facilities require the use of a specific heat transfer fluid that is designed to work to the correct temperature. Global Heat Transfer has worked with engineers in plastic, polymer and styrene applications for over 25 years by monitoring and maintaining thermal fluid to maximise output. Plastics, polymer and styrene production uses heat transfer equipment that often requires a broad temperature range in operation. Globaltherm™ heat transfer fluids – by Global Heat Transfer – are designed for optimum performance in plastic, polymer and styrene manufacturing applications including press heating, moulding, extrusion and coating rolls. Globaltherm™ heat transfer fluid works effectively to transfer heat over the complete temperature range specified by your application. 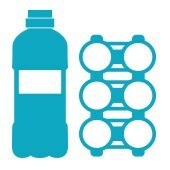 Globaltherm heat transfer fluids have been used extensively in the manufacturing of Polyethylene Terephthalate (PET), nylon, polyester and other synthetic fibres and engineers value the reliability and versatility of the range and the flexibility of using thermal fluids in both liquid and vapour phases. Globaltherm™ products provide the high temperature stability necessary to avoid fluid premature degradation at high operating temperatures. Thermal fluid naturally degrades over time and can reduce system heat transfer efficiency and increase maintenance expense if not monitored and maintained properly. 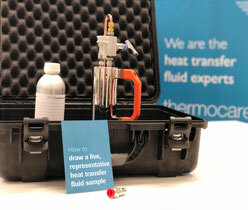 Global Heat Transfer is a key supplier supporting the rapid growth of thermal fluid use in manufacturing applications worldwide and has the production capacity to deliver high volumes of thermal fluid, within tight timeframes to remote locations. Globaltherm™ Syntec is the most popular high temperature liquid phase heat transfer fluid and delivers the highest level of customer satisfaction for plastic, polymer & styrene processing applications. Globaltherm™ Syntec ensures a trouble-free start up under most conditions and is readily pumpable at temperatures as low as -3°C (27°F). Globaltherm™ Syntec thermal fluid is works with heat transfer system applications operating up to 345°C (653°F) and can be pumped to -3°C (27°F). Globaltherm™ Syntec is specified for a wide variety of applications, including plastics processing, chemical industries and biodiesel applications and provides efficient performance at 345° C (653°F). Globaltherm™ Omnitech eutectic mixture of biphenyl and diphenyl oxide gives this heat transfer fluid the flexibility to perform in both liquid and vapour phases. It is also interchangeable (for top-up or design purposes) with other similar mix thermal fluids. Globaltherm™ Omnitech thermal fluid is excellent for use in heat transfer fluid systems which require precise temperature control, due to its ability to operate as a vapour phase heat transfer fluid. Globaltherm™ Omnitech has low viscosity to 12°C (54°F). Globaltherm™ Omnitech is a synthetic thermal fluid for use in plastic, polymer and styrene processing and also chemical and concentrated solar power applications for consistent performance. Marlotherm® SH thermal fluid is specified for use in closed loop, forced circulation heat transfer systems. The operating temperature range for Marlotherm® SH is from 250°C (482°F) to 350°C (662°F) and can be used intermittently at film temperatures as high as 380°C (716°F). Marlotherm® SH can be used in systems that require start-up temperatures as low as -5°C (23°F) without the need for heat tracing and without being pressurised. Marlotherm® SH thermal fluid is thermally stable up to 300°C (572°F) and can be used for extended periods (years) below this temperature without reducing performance. Marlotherm® SH has a low viscosity 17 cSt @ 40°C (104°F) with a pumping limit at -5°C (23°F) – making it one of the lowest in its fluid class. Marlotherm® SH thermal fluid has a flash point of 200°C – one of the highest in its fluid class. Marlotherm® SH has superior thermal stress resistance in the bulk outlet temperature range from 60°C-350°C (140°F - 662°F) and primary uses are plastics processing and chemical industries. Marlotherm® LH is recommended for use in the temperature range from -30°C (-22°F) to 280°C (536° F) and can be used intermittently at film temperatures up to 380°C (716° F). It may also be used in pressurised systems up to 360°C (680°F). Marlotherm® LH is a high performance thermal fluid that can be used in liquid and vapour form in closed loop, forced circulation heat transfer systems. It can be used in the liquid or liquid/vapour phase due to its narrow boiling range of around 4°C (39°F). Marlotherm® LH is used predominantly in plastic, polymer and styrene processing and chemical and pharmaceutical applications. Globaltherm® RP Heat transfer fluid is suitable for plastic, polymer and styrene applications. Globaltherm® RP delivers excellent thermal stability for plastic, polymer and styrene applications at the maximum use temperature. Globaltherm® RP Heat transfer fluid is recommended for use in plastic, polymer and styrene applications and a temperature range up to a maximum bulk temperature of 350°C (660°F) and a maximum film temperature of 375°C (710°F) with a high flash point at 194°C (381°F). Globaltherm® RP is a diaryl alkyl composition intended for use in plastic, polymer and styrene applications that require liquid phase heat transfer and can be used in non-pressurised systems. Globaltherm® RP can be pumped at 0°C (32°F) and has good low temperature properties, which reduces the need for heat tracing. Globaltherm® RP has a toxicity that is considered to be extremely low and degrades primarily to low molecular weight products, therefore negating build-up of high molecular weight products that must be filtered out of the system. Globaltherm® HF Heat transfer fluid is suitable for processing applications for plastic which require single fluid heating and cooling. Globaltherm® HF heat transfer fluid’s flash point is one of the industry’s highest at 276°C (530˚F). Not only does Globaltherm® HF Heat transfer fluid have one of the highest flash points in the market it also delivers trouble-free service for plastic processing applications, when managed correctly, as a result of its resilient blend of additives. Globaltherm® HF Heat transfer fluid is environmentally friendly, non-toxic and non-hazardous and requires no special handling in plastic processing applications. It is a superior high performance, energy efficient heat transfer fluid for plastics processing applications. Globaltherm® HF heat transfer fluid delivers superior resistance to extreme oxidation and sludging found in many manufacturing environments including plastic processing applications.